When Sevda Cibo returned to the Sarajevo suburb of Hadzici in March 1996 after spending most of the war as a refugee, she found her house in ruins with only a few walls still standing. With a family to support and no other means of earning an income to rebuild her home, she began using one simple skill – knitting. 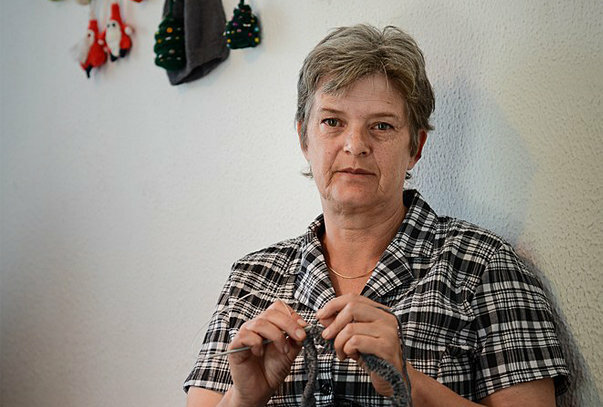 “When we returned to Hadzici after the war, everything was destroyed, but in time, I earned enough from knitting to rebuild the house,” said Cibo, now 55 and a widow. Every penny Cibo has earned since then has been invested into the house she shares with her younger son, his wife and their son. Her other son lives with his wife and three children nearby. None of them works, so Sevda’s knitting is the main source of income for them all. Cibo has found new support as a member of the Udruzene, Association of Women for the Preservation of Handicrafts, set up a year ago with about 50 female members from all over Bosnia and Herzegovina. 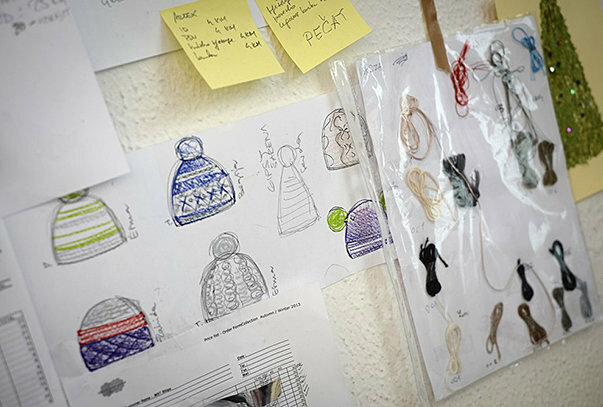 Members produce clothing which they mostly design themselves, sometimes using patterns from France and Japan, the markets to which they then export. “I wouldn’t be able to survive without knitting today because my only other source of income is [my late husband’s monthly] pension of 300 BAM [Bosnian marks; 150 euro],” Cibo said. “However, thanks to my knitting, both my children and I have enough”, she added as she slowly crocheted a cotton necklace with black and white flowers, a present for her grandchild. Udruzene was founded by Nadira Mingasson, a young woman who worked in children’s fashion during a long period spent living in France. “I had always looked for a way to establish a link between France and Bosnia because I really wanted to participate in the development and reconstruction of this country after the war,” Mingasson said. Many members of the association suffered greatly during the 1992-1995 conflict. Some were injured, spent time in prison camps or were sexually abused. Others lost family members or were forced from their homes. For many of them, crocheting and knitting mean more than just an extra income, but also contribute to psychological recovery. Fazila Bahtanovic is originally from Rogatica, a small town near Sarajevo, and lost a leg during the war, in May 1992. She also spent time in a Bosnian Serb-run prison camp in Sokolac before she fled to Sarajevo, where she still lives. Mingasson says she herself has noticed how fulfilling her members find their work, boosted by becoming independent members of their households. “When I’m knitting, I feel useful, and when I feel useful, I know what I am living for,” said Azra Dedic, another association member. Dedic, now 42, lived in Visegrad before the war, a historic town in eastern Bosnia where Bosnian Serb forces committed numerous crimes against the non-Serb population during the war. She lost many members of her family there and was forced to leave her home in June 1992. Today, she lives with her family in Tarcin, a small town near Sarajevo, and rarely visits Visegrad. But Dedic says that she has found peace and happiness in knitting for Udruzene and still remembers how thrilled she was when she received her first paycheck. “I was circling around the bank with my colleague, waiting to hear that the money was transferred to my account,” she recalled. “Then we went to a supermarket and bought a lot of stuff. We didn’t get much money, but we managed to buy a lot,” she added with a smile. Bahtanovic, too, spent her first payment on food, but now manages to “surprise her husband and herself with some clothing” bought with the money she earns. In early 2013, with the help of the Norwegian embassy in Sarajevo, Udruzene’s handicrafts were shown at a fair in Tokyo. The association has big plans, which include new sales exhibitions in Paris, Tokyo and Amsterdam, and will soon move into bigger premises, where they will be able to organise training and social events. “The idea is that we gather more women and increase our production,” said Mingasson. Mingasson believes that it is vital to invest in these women through crafts training as it also boosts their confidence.